It was the end of 1942 when a German heavy tank with extra thick armor and a powerful main gun first appeared on the North African front. The new tank, long-desired by the German soldiers who had hard-fought battles against the allies, became known as the Tiger I Ausf. 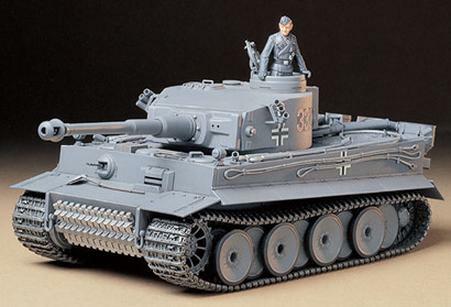 E. Development of the Tiger I began at the end of May 1941. The German Army Weapons Branch ordered the Henschel firm to vie with Porsche in producing a prototype. The first prototypes underwent trials on April 1942. The result of these and subsequent trial showed the superiority of the Henschel vehicle to the Porsche"s, and thus production orders were placed for it. The Henschel"s prototype had thick armor of 100mm at the front and 80mm on both sides, and the main gun was the then most potent, the 8.8cm KwK 36 L/56. The powerplant was Maybach"s HL 210 P45, yielding 650 horsepower. Mass production started already in August 1942 with little alteration from the prototype. Starting from November 1942, air pre-cleaners were added on the rear hull plate. The mantlet was partly strengthened and "S" mine dischargers were fitted on five mounting points around the hull roof beginning from December. Moreover, a loader"s periscope was fitted from January 1943. The Tiger I produced from November 1942 to July 1943 featured these modifications, are referred to as the early production. About 200 units of these early production versions were produced.